Every morning I check Bloomberg to see how much those darn interest rates have shot up. BTW - check out the new Bloomberg Business site. 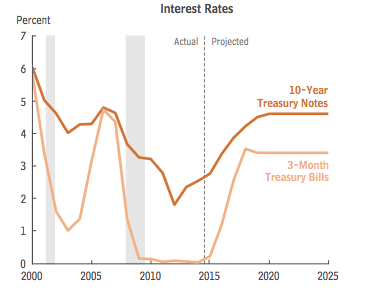 So how puzzling is it that the CBO - admittedly a few months ago - decided to use this projection for interest rates. As I said, this was done in Nov 14 so it's already wrong, but what could make rates jump as shown above that I can't see coming? Well, I'm not the only one puzzled. While I think this is an extreme long-shot, it is NOT unthinkable. 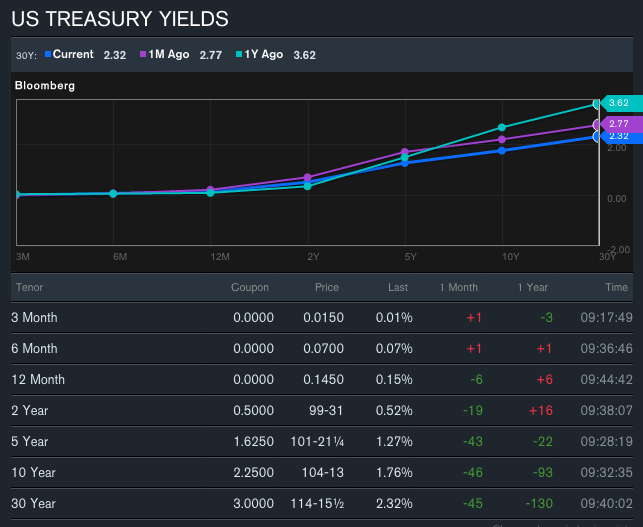 And as European yields continue to set multi-century lows, it's hard to find those forces that will counter the slow slide of US Treasuries yields. Can you imagine the heads exploding in Washington if Klein (above) is even close to correct? An Obama surplus??? WTF?? Andrew Sullivan, perhaps one of the greatest masters of the blog format, is ending his blog - The Daily Dish. I am not surprised. His output, range of subject and quality of analysis earned him the respect of friends and adversaries alike. I have freely linked and been led to wonderful information over my blogging career. More importantly, I have tried to emulate his variety, intensity, integrity, and thoughtfulness when posting my own stuff. But boy howdy - do I appreciate his decision. Blogging - especially at his staggering output level is exhausting and can take over your life very quietly. Given his precarious health, this decision is not just understandable but overdue, IMHO. Still, I will sorely miss his work. I'll bet I averaged an hour per day on his site, after following up pointers and sources. And like me, he was a conservative who could suddenly found himself unwelcome in the GOP as it careened to the hard right. With his strong Burkean philosophy, he could not join the abandonment of true conservative principles on matter of military intervention and egalitarianism. His voice and intellect framed many political debates, and his insights will be sorely missed. I will him well, in every sense of the word. 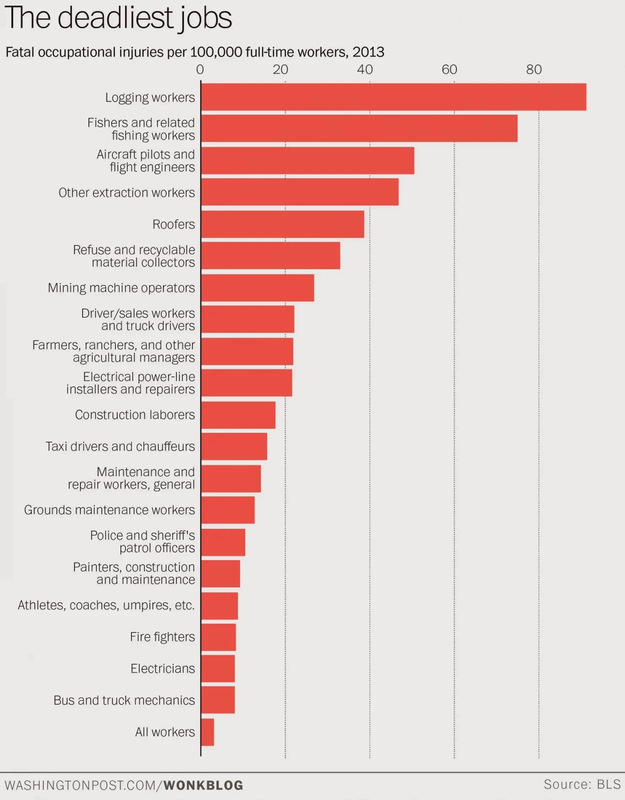 The "Lumberjack Song" in honor of the most dangerous job in the US. 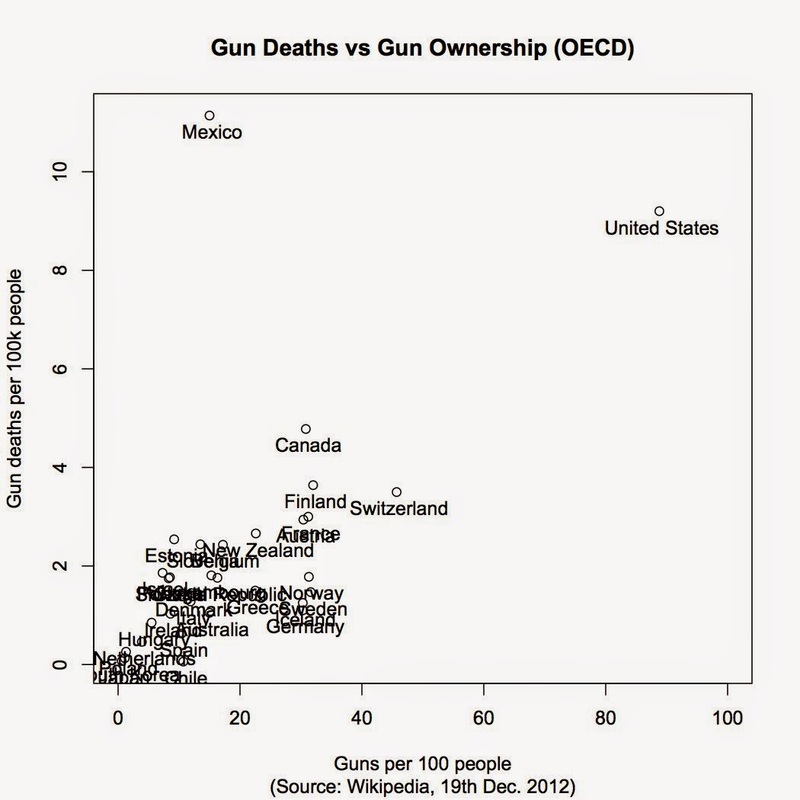 Seems to me like we're getting safer, but then a graph of children killed on the job would be much less encouraging. Jonathan Chait wrote a dense, but helpful essay about the rise and reaction to intense "political correctness" in leftist circles. This won't interest many of you, but as I waded through it (Chait is a thoughtful observer and polished writer) the anecdotes he relates kept ringing a bell in the back of my mind. I was frankly more puzzled than anything by this involved incident, having zero experience of this type of rancor. But it slowly dawned on me there are issues in agriculture that have generated our own system of similar p.c. For examples, undercover animal rightist action or GMO opposition has only one acceptable response from producers. While several degrees less strident and threatening, there is little room in our media for any response that leans away from support for the status quo. We are quick to take offense, implacable in argument, and inflexible in negotiation on the biggest issues facing our industry today. Our conduct is analogous to the rabid victimhood-seeking of the left, albeit much less prolix. Chait nails the longer term problem with this strategy/mindset. That was the trigger for me: exhaustion. Agriculture's unrelenting self-promotion and rigid sanctimoniousness has become boring. And if you haven't gotten the Tweet, that is the greatest sin in public discourse these days. Interesting. But then it hit me - is much of agriculture in a slo-mo hunker mode right now? We have been warned about the "party being over" for like, ever. Those admonitions have only gotten more shrill as grain prices swooned. And it could be there is a small portion of our conscience nagging that we really didn't totally deserve the money that fell from the skies (for grain producers) the last few years. You can make your own judgement. But if we are hunkering, it seems to me we are likely to overshoot, just as happened in NYC. Carrying this train of thought one step further, I think there might be some competitive openings should the worst case not arrive on time, or fail to show up at all. People are slow to abandon "hunker mode". Maybe because it seems to admit their own erroneous thinking, maybe because they remember a late hit sometime during their lives. I don't know for sure, but I think I'm going to risk unhunkering early. Or maybe I never really hunkered that much to begin with. I'm trying to move past the stupefying idiocy of refusing to get measles vaccinations. (Yeah - I'm looking at you, CA). We have learned from GMO's, climate change, evolution, etc. that we are not going to reason effectively with those who embrace non-science, so what else can we do? First, there are reasonable grounds for compulsion. I know, I know - Big Government Overreach - but this is clearly overridden by the Spock Principle: The needs of the Many outweigh the needs of the Few. Actually, this principle is woven through many common law fundamentals, and as Volokh points out above, has been upheld in various forms. Measles can be very dangerous. The effectiveness math demonstrates we need to get to about 96% vaccination rates to provide herd immunity. Idea: Auction off the rights to be in the unvaccinated 4%. Hey - we're talking Orange County here where anti-vaxxers appear to be mostly well-off. I bet they could raise enough to lower the cost of vaccine for others, or add a new football stadium at the local school. As is so often the case, The Onion says it best. Farmers may win the war on the EPA with Congressional help. But I've always thought that was not the real threat to our insistence on farming the way we want to. The bigger issue is the willingness of those around us to tolerate any externalities like runoff, smells, dust, etc. If real harm is being done, I can't see how we can prevail in our judicial system regardless of politics. We may be about to test that theory. Des Moines, Iowa, is confronting the farms that surround it over pollution in two rivers that supply the city with drinking water. Des Moines Water Works says it will sue three neighboring counties for high nitrate levels in the Raccoon and Des Moines rivers. It's a novel attempt to control fertilizer runoff from farms, which has been largely unregulated.Too much nitrate can be a health risk, especially for infants under the age of 6 months, and it's difficult to remove from water. Filtering out nitrates cost the Des Moines water utility $900,000 in 2013.Bill Stowe, general manager of the Des Moines Water Works, told Iowa Public Radio in an interview last week that "we are seeing the public water supply directly risked by high nitrate concentrations." This is reminiscent of jailing Al Capone on income tax charges, or OJ on (civil) wrongful death - by civil rather than criminal prosecution. While the burden of proof is on the plaintiff, there seems to me to be consensus that the N especially, and probably the P, is ours. While it seems hard to comprehend, farmers could eventually come to demand some regulatory relief that would protect them from civil actions like this. Too, the DSM lawsuit outcome will affect strip-tillers and hillside plowers the same, which won't go down easy either. The Iowa suit will be closely watched by environmental groups and government entities sniffing around for a tobacco-like settlement jackpot. I think that is a real possibility. It could be funded by a tax of some kind on fertilizer or per acre or (insert your mechanism guess here). Whichever, cities downstream of us aren't going to let this slip by their treasuries. A straight-up parody of a crop failure is making the rounds in ag today. First, it's well done - nobody breaks character and the premise is amusing. But if you are like me it is more revealing than riotous. Notice how you stop laughing and start squirming about halfway through. This is formulaic journalism from the camera angles to the composition to the unctuous announcer. Any one of us could have written the close, right? We've assumed this role of victim for so long, we could start doing stories like this by shorthand, just like the old prison joke where inmates told jokes by number. And if it's that familiar, maybe this is how our story really is shaped - we just insert a new crop and farmer accent. We are obsessed with telling our story, but we need a new script, methinks. I'm gonna start posting again, but we're dealing with some health issues here at the Phipps farm. It comes with being our age, but we got a scare when Jan had a serious heart event Friday. She's good now with complete recovery on the horizon, but my New Year resolution to restart blogging was the first casualty. Anyhoo, even though blogging is over, I miss it and will get back to the game. BTW, I will tweet my posts, FWIW. Follow me @jwphipps - you won't have to check here as often. I still don't understand why there is no self-propelled, autonomous grain cart. (I call it a catcher) It would be controlled by the combine operator, be self-contained and on tracks. I'm thinking a half-cab like a spotter tractor for trucks. Sure Kinze has the remote control cart, but why haven't we put engines on grain carts like we did for sprayers? In all the IoT possibilities, I think this is #1 for grain farmers. This is not a flying car. It would be astonishingly productive, with a high marginal value during harvest. The three person minimum (combine, cart, trucks) would go back to the dump-on-the-end minimum of two persons, allowing father-son, brother-brother, and husband-wife pairs to keep a combine rolling continuously. Instead we get drones and multi-hybrid planters - both answers looking for a problem.